If you're a biking enthusiast who loves to spend their time exploring the great outdoors, you may have been tempted to take your canine companion along for the ride. Unfortunately, this isn't always a viable option for some pets. While everyone would love to believe that their leashed dog will trot next to their bike unbothered, that's rarely the case. Having your dog run next to your bike can be pretty dangerous. You run the risk of colliding with your pup, getting their leash tangled in the many moving parts of your bicycle, or having your dog drag you down as they sprint away. Needless to say, you may want to explore some other options to take your dog on a bike ride. Bike baskets may be the answer you're looking for. Baskets are ideal for small to medium-sized dogs. They can be attached directly to your bike for safety. Your furry friend will be able to sit back and enjoy the scenery without having to keep up. There are a number of great products out there. To get you started on your search, here are some of the best options on the market. This versatile basket from Petsfit is great if you want a multipurpose product. It can be used on your bike or as a standard carrier. The outside of the basket is made of tough Oxford cloth. The top features a drawstring opening. This allows you to keep your pet secure. You can open it enough to let their head out while keeping their body covered. There's also a built-in leash clip and a soft padded bottom. 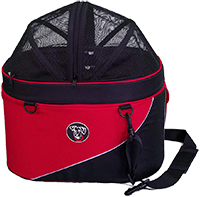 Mesh pockets can be found on the sides of the basket for additional storage. The entire basket is reinforced and stable. The Tagalong bike basket from Solvit has a classic look and tough build. The outside of the bag is made of resin wicker. It's durable and weather-resistant. Inside, the basket is lined with a soft faux sheepskin material. It can be removed for easy cleaning. There's also an adjustable safety leash inside for added security. Attaching the basket to the front of the bike is very easy. It has a durable bracket that can be adjusted in three ways. You can fit it on virtually any bike without affecting the cables. The basket comes with a removable sunshade that's also made of resin wicker. 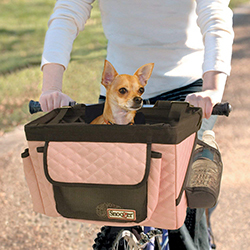 The Snoozer Sporty Bike basket is another versatile option that can be used as a standard carrier. It has spacious storage pockets and a mesh bottle holder. The basket is attached to the handlebars via adjustable straps and a strong bracket. The bracket attaches to the vertical handlebar support. Inside, you'll find a removable pad as well as a chin rest. Durable material is used throughout. It's also supported by a rigid frame. However, when it's not in use, the basket easily folds down for storage. A removable rain cover is included. It has an adjustable opening that lets your dog's head through. This bike basket from Anzome has a very simple design. However, its simplicity makes it a great option if you use your bike regularly. It attaches to the front of your bike with a bracket. The bracket has a quick release function that lets you take it off without having to bring your tools out. A metal rim is used to hold a waterproof basket. The bottom of the basket is made of thick polyurethane. The materials provide adequate support for your dog and are easy to clean. A weather-resistant bag is built into the sides of the basket. There's also interior pockets, exterior pockets, and additional vertical supports. This large bike basket from Jack and Dixie does double duty as an over-the-shoulder carrier. The shoulder strap is removable and can be stored in one of the basket's two zippered compartments when it's not in use. The basket is made of tough material and has an internal wire frame that adds additional support. It can be attached to the handlebars with two durable straps. They're easy to adjust so that you can get the perfect fit. There's also a metal piece on the bottom of the basket that sits against the vertical handlebar support. On the front of the basket, reflective material is included to keep you safe. 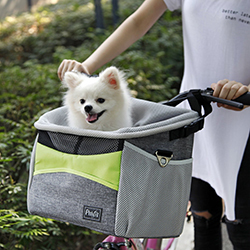 From DoggyRide is the Cocoon bike basket. This product gets its colorful name from the included dome. It comes with a mesh dome that provides wind protection and a clear plastic dome that provides rain protection. The domes can also be removed to create an open basket. The outside of the unit is made of tough polyester while the inside is made of water-resistant nylon. It also comes with a removable shoulder strap. You can use this basket a few different ways. It can be attached to your bike's handlebars with a quick-release mounting bracket. You can also use it as a standard pet carrier or as a car seat. 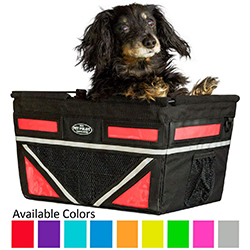 If you have a slightly bigger dog, the Pet-Pilot MAX basket from Travelin K9 may be for you. It measures 16 inches long by approximately 13.5 inches wide. It's also 9.5 inches tall. It's made of a durable fabric material and has ventilating mesh panels to keep your pooch cool. To support your dog's weight, the frame of the basket is made of steel. It has a heavy-duty mounting bracket that can be attached to your handlebars. Inside, the basket has a padded floor, soft lining, and two-point safety harness. On the outside, there are mesh pockets and reflective strips for safety. This basket from Snoozer has an impressive weight capacity thanks to its unique build. The walls of the basket are made entirely out of formed foam. The bottom is reinforced with durable plywood. This basket is mounted on the rear of the bike. 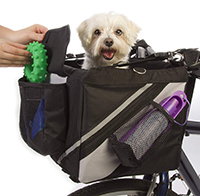 It's compatible with bike mounts and offers plenty of support for your dog. The foam material is covered with a removable lining made of quilt and fleece. It can be washed in a machine for convenience. The basket also has a three-point safety strap to keep your dog secure and a large reflective stripe for enhanced visibility. Why Use a Bike Basket? 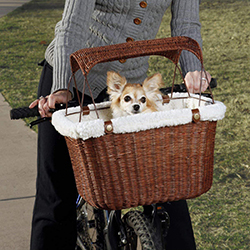 There are many reasons why a dog owner might choose to use a dog bike basket. One of the biggest is safety. As mentioned earlier, it's incredibly dangerous to have your dog running next to you on a bike. Leashes can easily become tangled in the chain of your bike or the wheel spokes. You also run the risk of your dog getting distracted. They may catch a whiff of another animal and race toward it. This could result in injuries for both you and your dog. If you're in a particularly rough bike path, your dog is also at risk of hurting themselves on the terrain. 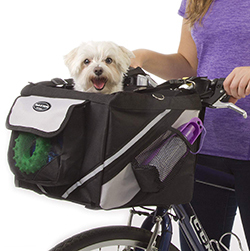 Another great benefit of dog bike baskets is that they give your dog a chance to explore their surroundings without having to exert much energy. Smaller dogs simply aren't able to keep up most of the time. If your dog is a bit older or has recently experienced an injury, running alongside your bike may do more harm than good. Just because your dog isn't able to keep up doesn't mean that they have to stay cooped up in your home all day. Baskets allow them to explore new territory safely. Sometimes, you just don't want your dog to run on a leash. Mucky terrain and wet grass can be a pain to clean up. If you drove to your favorite bike path, you'd have to deal with the mess your dog makes in your car. 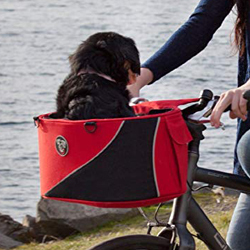 A bike basket keeps your pup out of the elements. They'll be able to stay clean the entire time. There are a few different types of dog bike baskets available. They all come with their own unique design features and benefits. When you're choosing the right product, it's important that you consider the overall design of the basket and the needs of your pup. Baskets that mount onto the handlebars of your bike are the most common. They're relatively easy to attach and often come with additional storage compartments for the essentials. One of the best things about these types of baskets is that they put your dog front and center. They will be in your field of vision at all times. This is great for keeping an eye out on your dog and may make your canine companion feel a bit more comfortable. 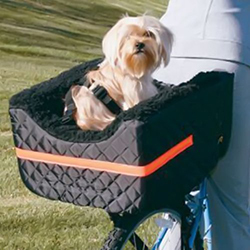 These dog baskets are mounted on the back of the bicycle seat. They look very similar to the previous type of baskets. However, they attach to compatible rear bike racks. One notable benefit of these baskets is that they may be easier for you to control. There's no added weight to the handlebars, so you'll have an easier time steering the bicycle. If you're not a skilled bike rider, this design may make it easier for you to adjust. Domed baskets are great if you want to give your furry friend a bit more protection. They come with a collapsible dome that can be placed on top of the basket. Depending on the particular product you get, it may be made from a tough wind-resistant material or clear mesh. Either way, your pup will get a bit more protection from the elements. Both materials keep the wind at bay. Closed domes can also help your pup adjust. Canines love to go into a dark hiding spot whenever they're starting to feel some stress. The closed nature of the dome will give them that added sense of security that they need to feel comfortable. If you have a particularly rambunctious pup, domed baskets can also help to keep your pooch safe. While most baskets come with a security system to prevent your dog from jumping out, domes take it a step further. They'll be limited in how high they can stand and there are no ledges to climb on. You can ride confidently knowing that your dog is safe. Not all dog bike baskets are made the same. There's a lot to consider when you're trying to find the right product for you and your dog. Keep these factors in mind and you'll be able to narrow down your options in no time. The first thing you'll need to consider is the basket's size and weight limitations. Baskets are designed to accommodate dogs of different weight ranges. Before you start your search, weigh your dog to make sure that you're getting a product that can support them. Size is also important. It's a fine line between providing them with a basket that's too big and one that's too small. Smaller baskets may make your dog feel cramped. This could ultimately lead to stress. However, with larger baskets, they may start to slide around as you ride. A good rule of thumb is to get something that's similar in size to their bed. It'll be something that they're already used to. Furthermore, they'll have the option to sit up or lay down as they please. These factors all come down to comfort and security. You don't want to go with a basket that's made out of cheap and flimsy materials. If you do, you run the risk of the basket falling apart during your ride. 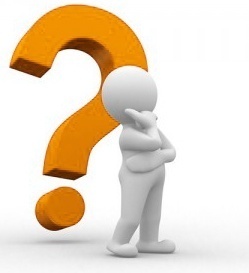 You want to go with high-quality materials that are tough and capable of lasting for many years. Baskets made out of wicker or thick woven fabric are good options. The materials used can also play a big role in your dog's comfort. Your pup will be a bit wary of going on rides with you, especially during the training phase. You want to make the experience as stress-free as possible. Look out for baskets that provide your dog with ample support. The floor of the basket should be rigid. Wicker baskets are strong and feel like a secure floor to your pup. If the basket is made of fabric, make sure that there are metal supports inside. Alternatively, you can get a basket with a thick foam bottom. The key is to make sure that your dog doesn't feel like they're going to fall through at every bump on the bike path. Your dog bike basket needs to have an anchor for a leash or harness. Anchor points should be made of a durable rip-proof material. They should also be reinforced to make sure that there will be no issues during your ride. The anchors serve a very important purpose. They keep your dog stable in the basket and prevents them from jumping out when they shouldn't. 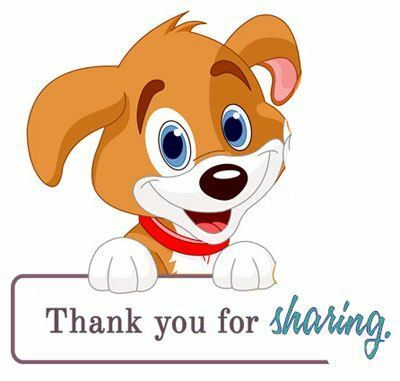 Before you purchase a basket, make sure that it's compatible with your dog's collar or harness system. Bike baskets are an investment that can serve you well for many years to come, so it's always great to have some extras that you can rely on. Baskets with additional side pockets can save you from having to carry an additional backpack. These pockets can be used to keep your identification and phone within reach. They can also be used to house treats and water for your pooch. Another great extra is a multi-purpose design. Some bags can be used as standard carriers or car seats. These bags are very versatile and can help you make the most out of your money. With great extra features, you'll find yourself using the dog basket more often than just on the bike trail. Before you hit the nearest trail, you'll need to train your dog to use the bike basket. It can be very overwhelming for dogs in the beginning. You're essentially constraining them and exposing them to a lot of new sensations all at one time. It's important to take things slow. First, you should place your dog in the basket and carry it around the house. This can get them comfortable with being in the basket and moving high off the ground. Use soft words, positive language, and plenty of treats. Once they're used to being in the basket, you can put the basket on the bike. Simply stand the bike up and stand next to your dog. Pay close attention to their behavior. If your dog looks like they're about to jump out, reassure them and let them know that everything is alright. Then, you can start walking the bike around. Go slowly around your yard, praising your pup the entire time. You can find small dips in the ground or light bumps to get them used to the sensation of uneven terrain. You can also introduce a new training word. Saying something as simple as "bump" when you're about to go over uneven ground will prepare them before it happens. After your dog has gotten comfortable with light riding, you can hop on the bike and see how they do when you're behind the handlebars. Ride around slowly and keep talking to your dog. You need to let them know that you're still there and that the experience is a positive one. You can slowly work your way up to normal bike trail from there. As always, just make sure to take frequent breaks to give your dog some affection and treats. To ensure that you and your dog stay safe on your ride, here are some safety tips you need to keep in mind. Most baskets come with clips that can be used to attach to the dog's leash or harness. Some even have multiple anchor points so that you can keep your dog secure from all angles. You need to use these clips each and every time you take your dog out. While you may think that your dog doesn't need them, all it takes is one distraction for them to jump out. This can lead to potentially fatal injuries. The clips are built into the basket for a reason, so it's best not to take any chances. If you're riding at faster speeds, you may want to invest in some eye protection for your dog. Sand and debris are often kicked up as you ride. This can easily get into your dog's eye and cause ocular issues. If you don't have a dome on your basket, dog goggles are a great way to make sure that your pup's eyes are comfortable. They have transparent lenses so that your dog is still able to enjoy the view. Always trust your gut instincts when you're cycling with your dog. This applies to the path you're taking as well as the behavior of your dog. Dogs have bad days just like humans. They may not be feeling well or they may have a ton of built-up energy. If you feel that your dog's behavior can cause some problems during your ride, don't take the risk. You should never force your dog to do something that they're not ready to do. If your dog is having trouble getting comfortable with being in their basket, you can seek professional training assistance. Instead of rushing the process, it's better to do things right to ensure that you and your dog can stay safe. It's important to remember that taking your dog on a basket is adding significant weight to your bike. If you're a complete novice yourself to the bike-riding world, you may want to do some training before you take your dog. You need to have the strength and endurance to take on the extra weight. Otherwise, your putting you and your dog at risk. 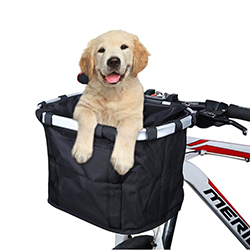 Dog bike baskets are a worthy investment for any biking enthusiasts. They let you take your dog out for a fun ride without much risk. You can keep an eye on your canine companion and make sure that they're comfortable while you're both enjoying the fresh air. Also Read: ​Taking Your Dog On a Run: Use a Good Leash!